As the GOP debates went on a few nights past, there was another racist crime being committed at the University of Missouri. I watched my Twitter feed as students began to panic because some sick, racist psycho decided to threaten every Black student with death. On a social media app, YikYak, an anonymous person(s) posted death threats. 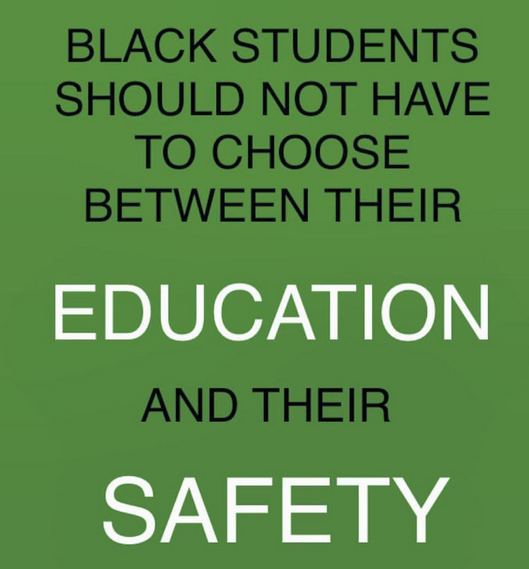 Kill any Black student on sight, is basically what this person said he would do. Where is the media? Where is security? While more hate filled monsters chanted hate -pointlessly- into the night, students tweeted the location of these dangerous sites to others, asked for the cruelty to stop and were given the worst advice ever from the University of Missouri’s “security”. Their main security posted this, pretty much leaving students in a state of confusion without the security and safety they deserve. 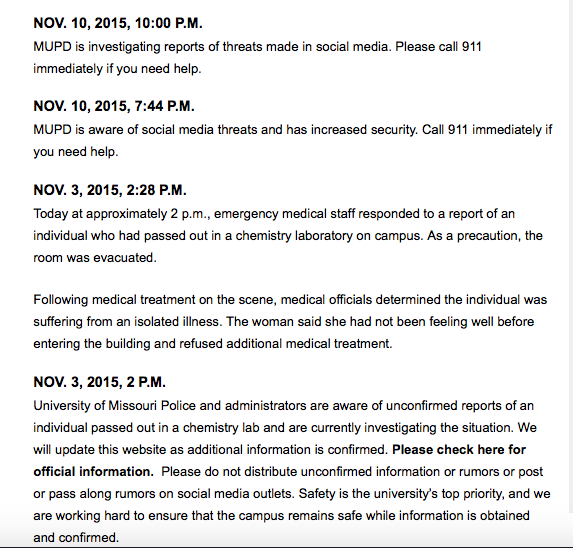 On the left is a screen shot of the information posted for students that night. The next post isn’t made until November 11th, at 6:00am when they have the main suspect in custody. – Where is the media!? Yes, the debates were on but had this been a threat made by Blacks to whites this would have been breaking news. Quickly, the situation was growing more intense, but the security was doing the very least they could do, it seemed to me. I watched tweets, videos and photos coming up in my feed, I spoke with friends as I could and felt more and more sick. The GOP debates were still raging on, where was the national attention? We all know had it been reversed it’d have stopped every channel! Where do these unwarranted, unfounded and flat out stupid feelings some whites seem to have towards Black people derive from? Why in hell was this not treated as seriously as it should have been?! deaths and beatings of white people. That’s insane and a few months back I made two videos in response to one of these fools I was ‘talking to’ online. Sorry but I’ve no better term than fool; that’s as nice as I can put it. If you desire, you can watch them here. The second one is I’ve put up first, above this text. The next one can be found below. for I think it sums up everything best. The first one is at the bottom, and I feel it has good points as well, I just think the first one needed to be the one I ended the conversation with the racist *#($ with. And I’m bringing up Black Lives Matter for a reason. There is a “person of interest” the cops are looking for regarding vandalism on a large scale targeting the Black Lives Matter movement. Click here to read the article and help identify her. Thank you! JACKSON, Miss. (AP) — Sixty years after a black Chicago teenager was killed for whistling at a white woman in Mississippi, relatives and civil rights activists are holding church services and movie screenings to remember Emmett Till. They’re also trying to continue the legacy of his late mother, Mamie Till Mobley, who worked with young people and encouraged them to challenge injustice in their everyday lives. It’s a message that Deborah Watts, a distant cousin of Till’s, sees as relevant amid the killings in recent years of young black men such as Trayvon Martin in Florida and Tamir Rice in Ohio. Watts, of Minneapolis, was a toddler when Till was killed. She said that as she grew up, she spoke often with Mobley about Till. “It was her motivation to turn his death into something positive,” Watts said Thursday in Jackson. I found this interesting so…. Thursday, the Justice Department Bureau of Justice Statistics reported 2 of 3 hate crimes in America go unreported to police, and it is continuing to drop. The drop in victims not reporting these violent attacks to their local or state police is a reason I understand and one which shouldn’t shock anyone: they believe the cops either can’t help, or will not help. Given how the police behave, I must say I feel the same. Before I go on, I think I will give a couple of links out to just a few stories which support the reasons why so many of us do not trust police. The book I highly recommend is Not Guilty. It consists of essays by 12 Black American men telling their story about how non-whites and the poor are treated in America. One of the writers I believe either is or was a police officer. In his essay, he tells a tragic story regarding how the police “responded” to a dispute in a poor and non-white neighborhood. It is an incident which paints a picture of how cops respond to violence across American projects and ghettos. If you want evidence via an article, these links will take you to articles of people who have spoken out against the behavior of former colleagues. For these, click HERE or this article – more evidence to the legitimate claim that there is no reason I see that would suggest reporting a hate crime to most police departments in America would result in anything positive. Sadly, they aren’t the only ones who have told stories such as these. Reporting a hate crime to those who commit hate crimes themselves doesn’t seem like an idea for success, in my opinion. And apparently plenty of others feel the same way. If the people don’t trust the police, that should speak VOLUMES and it also should be a reminder to all of us to drop our differences and unite together against police misconduct, hate crimes, and police brutality. Just to name a few issues. Below are the statistics and other interesting information.